I have now completed the crash course in grieving. 365 days ago, my mom took her last breath, and in so many ways, it feels like I did too. I know three things for sure about loss. The first is that no one’s experience is the same and no one walks the same path. The second is that there’s no frigging book or podcast or class that can give you a clue as to how to navigate profound grief. And the third thing, the thing I am most sure of, is that I am not the same man I was on November 1st, 2016. I am so much more fragile. I have cried in front of just about every human being I know. I am so much weaker. A memory, a random photo, or hearing her voice on a home video can bring me to my knees. I am so much more introverted. The guy who never missed a party is the same guy who’s sneaking out early or not showing up at all. And, I am so much wearier. It’s not about getting enough sleep. It’s just hard work to hurt this much. But, I am also so much more intentional. I say I love you more often and to more people. I am quicker to hug, to listen and to compliment. I am taking more chances, not letting the craziness of an idea shoo it from my heart and I am trying very hard to live my life boldly, celebrating the joys at the top of my lungs and allowing the lows to be what they will be and not shove them under the rug. I’m also completely different when someone I know suffers a loss. I get it now. I stay in touch. I check in periodically after life has gone back to “normal” because I know it hasn’t. The friends who, still to this day, send me a random text to check in on my heart were the oxygen that got me through the first couple months. I also know one thing that is absolutely not true, at least for me. I’ve been told countless times that the first year is the hardest. That’s crap. Don’t get me wrong — I am definitely more functional than I was in the first few months. I no longer feel suffocated in the grief, and I can (and am) be happy and productive. But the depth of the loss hasn’t lessened, and I don’t expect that it will. If anything – the first year is the most uncomfortable. I wear the grief better and more comfortably now. It’s just a part of who I am. But I don’t believe that it gets “better.” I will never miss her less. There’s no expiration date on grief. I miss everything about my mom. I miss her laugh. I miss her sarcasm. I miss how she adored my daughter. I miss how she made fun of herself, and I miss being her confidante and having her as mine. Whether we talked for a minute or hours – I miss her daily presence. But selfishly, what I miss most is who I was in her eyes. Somehow, for some reason, when she looked at me – she saw the best of who I was capable of being, even when that guy was nowhere in sight. It’s an incredible gift to be loved so unconditionally and to have someone believe that you actually hung the moon. The Drew that I saw through her eyes gave me courage and strength and comfort. I wanted so badly to live up to her perception of me and have probably spent most of my life trying to prove her right. 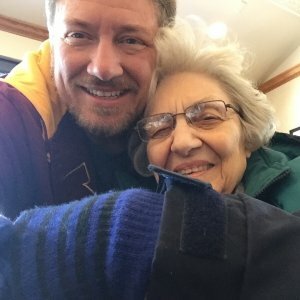 As dementia robbed her of so much and she couldn’t communicate complex thoughts anymore, she would simply break into tears when I walked into the room because she was so relieved and happy to see me. I was that for her. And in many ways, she was that for me. Maybe, in the end, grief is about being selfish or at the very least, self-centered. I am so glad she isn’t suffering anymore. That she isn’t afraid or confused. I truly believe she is in a better place, in a better state and is being celebrated in heaven for the remarkable human being that she was. She was ready. But it turns out that I was not. I wasn’t ready to say goodbye. I wasn’t ready to be without her. And I wasn’t ready to say goodbye to the man who only existed in her eyes. A year later, I am no more ready. But I am more resigned to her absence. So much of who I am is who she molded me to be. And it turns out that she still is. Her loss has changed me and perhaps in some ways, brought me a little closer to being the man she believed I could be.